Our RV Lifestyle Road Test Team visited Globetrotter RV in Bolton, Ontario, to road test the first 2014 Open Range 386 FLR (front living room) fifth wheel to arrive in Canada – this is a model that is distinctively different from the majority of trailers in this size and price range, thanks to a floor plan that transforms the fifth wheel interior into a split-level penthouse style campground castle. 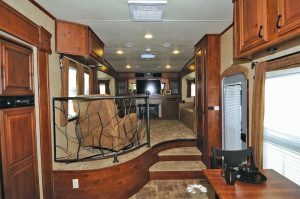 The Open Range designers have taken advantage of the raised front section of the fifth wheel to create an outstanding living room area. With sofa beds nestled into slide-outs on either side of the trailer you have the equivalent of a 12’ x 14’ room – that’s residential style living! 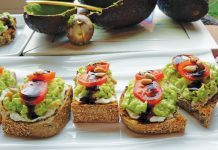 With no bulkheads to break your line of sight from the galley to the front of the trailer, you have an unobstructed view spanning more than 20 feet. To further enhance the effect of open space the refrigerator, oven, and microwave are placed in a slide-out in the galley, producing an effective floor space equivalent to an 8’ x 10’ kitchen, complete with free-standing dinette. To top off the galley our test vehicle had an optional 12 cubic foot residential refrigerator – very impressive, even for a trailer of this size, the standard refrigerator is 8 cubic feet. Twin sofa beds in the living room slideouts flank a deluxe entertainment centre. 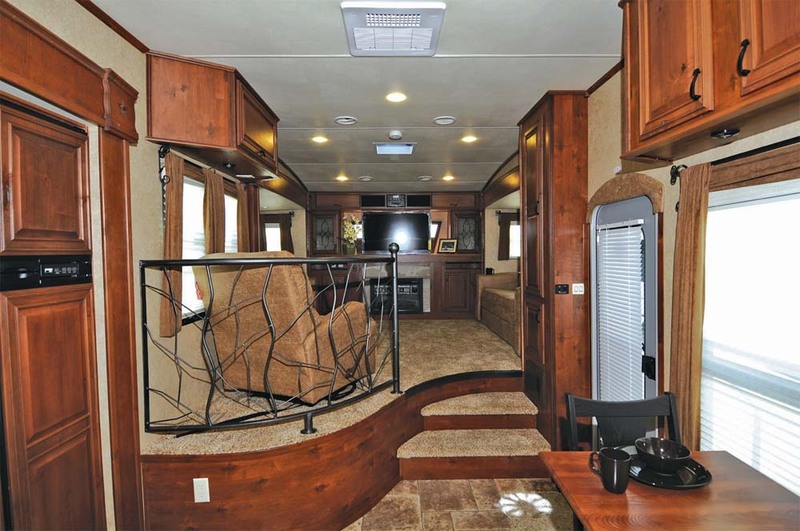 We often select road test vehicles for the uniqueness of the interior layout, and the 386 FLR certainly qualifies based on the front and mid section of the floor plan, but when you step through the door into the master bedroom suite the true “wow factor” of the layout becomes apparent… the rear bedroom is massive – with a large wardrobe and a washer/dryer compartment in a slide-out on the passenger side of the vehicle, and a 72” x 80” bed in a slide-out on the driver’s side this is one of the best bedroom configurations in the industry. When you open the door to the ensuite bathroom, and see the 48” x 30” shower, the vanity, and linen closet, it is hard to believe that all of this comfort fits into a trailer! 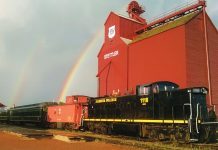 To view a 360° tour of the Open Range 386 FLR click here. Look for the menus superimposed over the picture to view the front or rear portions of the fifth wheel. The Open Range 386 FLR towed effortlessly behind our 2014 GMC Denali HD, provided courtesy of MacMaster Buick GMC in Orangeville, Ontario. 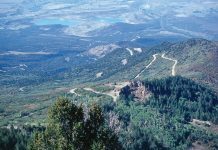 This was the same tow vehicle that we tested in the foothills of the Rockies, equipped with a full range of trailer towing options. We were particularly impressed with the new GMC integrated trailer brake control system, which displays vital information on the electronic dash, and allows you to make adjustments to the trailer brake force and synchronization as you roll. 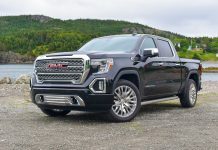 The GMC also has a state-of-the-art cruise control system that takes into consideration the trailer weight, applying the brakes as required on a downhill slope. 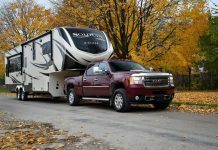 The new GMC is an exceptional tow vehicle – check out the specs at www.gmc.gm.ca From the RV perspective, this trailer is very well suited for long distance touring. 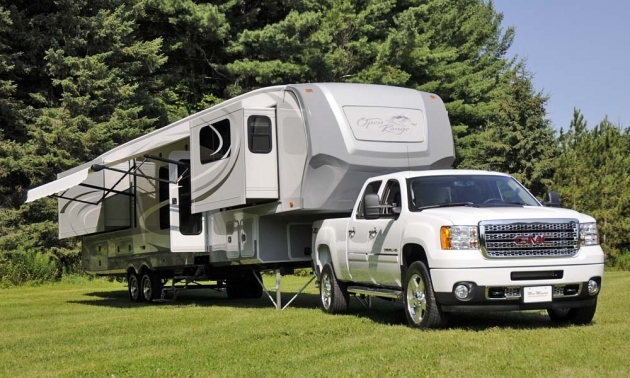 With excellent brakes, alloy rims, and quality tires filled with nitrogen to hold pressure for long periods in a variety of temperatures, the Open Range fifth wheel is a pleasure both on the road and in the campsite. 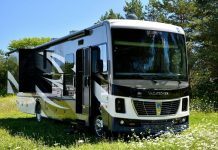 Open Range builds a very high quality product, engineered for years of trouble-free touring and four-season camping comfort. 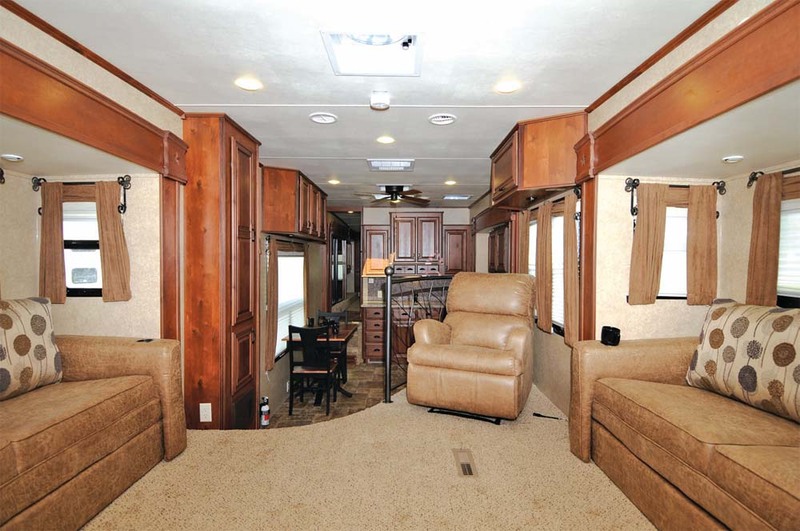 With a 100-inch wide body and a 42-inch deep main slide, there is ample space for interior amenities. The split level floor plan creates a large open area. 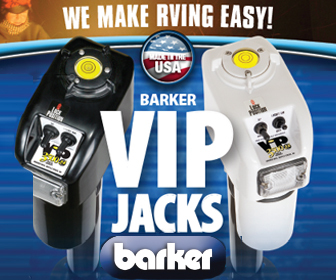 Open Range uses high quality materials and components throughout the vehicle. The frameless windows are a high-end item design that enhances appearance and reduces drag. 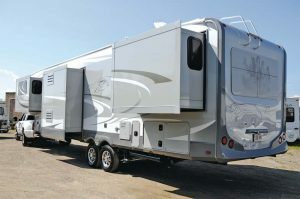 We were particularly impressed with the use of advanced components and wood filled tubular aluminum construction methods to produce a trailer that is 10-15% lighter than most of the similar sized models in the industry, especially when the Open Range utilizes real plywood throughout the trailer, rather than the particle board that is often seen in the RV industry. The electric slide-outs feature aircraft grade cables in a system that is lighter and more efficient than what we typically see on vehicles of this type. 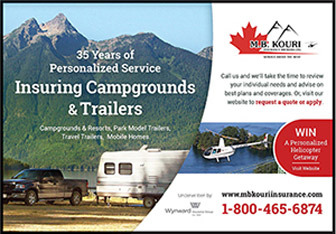 From top to bottom, this trailer is engineered for the Canadian RV experience. 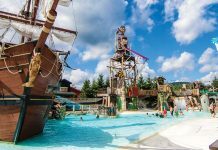 The roof features a one-piece PVC layer above half-inch plywood decking, insulated to R38 standards. There is a removable ladder to give you access to the roof for routine inspections and maintenance. R38 insulation is also used in the floor, in the slide-outs, and below the enclosed tanks in the underbelly of the unit. If you have ever taken a shower on a cold spring morning, you will appreciate the double layer insulated floor in the bathroom, and the floor ducted heating system circulates warm air throughout the interior, as well protecting the concealed water tanks. 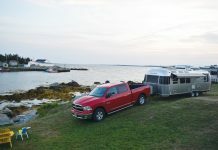 In warmer weather, the Open Range utilizes racetrack ducting to distribute the cool breeze from the dual Dometic Brisk Air roof A/C units throughout the trailer. From the front of the living room you have an unobstructed line of sight to the back of the galley. In a trailer this size, it is not unusual to hear creaks and squeaks when you walk from front to back in the unit. The Open Range floor is solid, with 12-inch oncentre floor joists. Outside the trailer, the Lamilux gelcoat exterior looks great and should last a very long time. 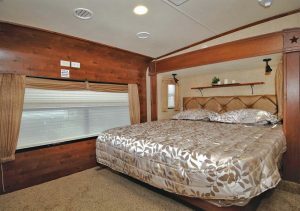 At the rear of the trailer, the large bedroom window is covered by a graphic design that you can see through from the inside, but not from the exterior. 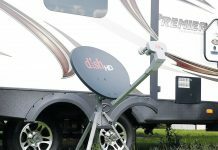 At the front of the trailer a thermoplastic rock guard protects the front cap, and along the side extended exterior skirting protects the vehicle and enhances the campsite appeal. All of the metal storage compartment doors have “slam” type latches that work better than most of the latches used in the industry. 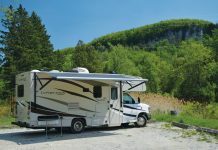 Even the slideouts have high-tech engineering, with laminated end walls and slide topper awnings to assure durability. Setting up the Open Range is a breeze, thanks to the Ground Control one-touch automatic electric leveling system and the convenience of a dedicated hookup compartment on the rear of the driver’s side of the vehicle. This fifth wheel features a JT Strong Arm stabilizing system that substantially reduces the effect of wind and movement of people inside the trailer – an excellent innovation that utilizes a triangulation principle similar to the suspension on a race car… you can bolt-on this stabilization enhancement to any RV – ask your RV dealer to contact The Mobile Outfitters for models specific to your trailer or motorhome. 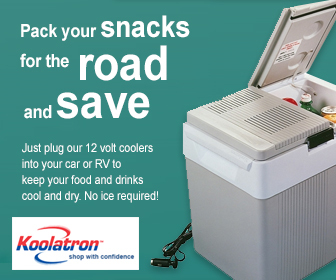 It only takes a few minutes to extend the five slide-outs and the electric 15’ patio awning, and the telescopic sewer hose container is a very useful feature – you can set it up quickly, wash it out in a few seconds, and stow it securely when you are ready to hit the road. 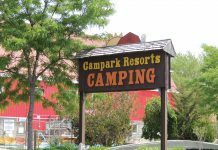 The Open Range is fully equipped from the factory, but there are a few options that you might want to consider – for example, our test vehicle was equipped with an optional Cummins Onan generator, ideal for trips when full service campsites are not available, and the optional washer/dryer would be a plus if your campsite is a long way from the campground facilities. Your guests will be impressed with this trailer as soon as they climb the stairs. The grab bar is well placed, the exterior LED lamp illuminates your entranceway, and the full view vented entrance door is easily accessed by young and old. 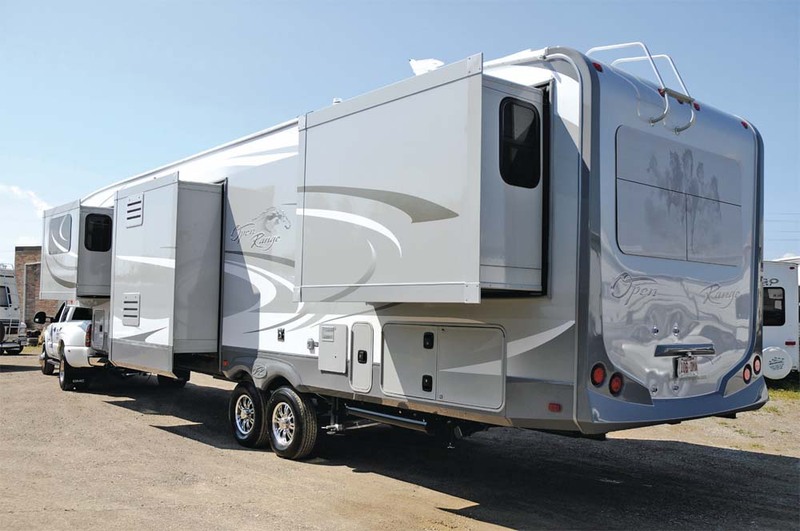 Three deep slide-outs on the driver side and two more on the passenger side make this fifth wheel an exceptionally spacious home on wheels. With the front living room the focal point for this elegant fifth wheel, we were eager to check out the entertainment systems. Touch a button and the high definition LED TV rises from behind the electric “fireplace” at the base of the front entertainment centre… select your favourite program or DVD and concert quality sound fills the area. 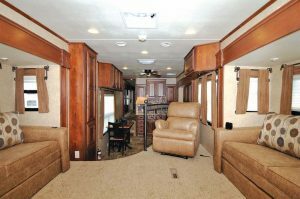 With an LED TV, viewing is excellent from the twin sofas, the recliner, and the dinette seating… the whole family can enjoy the entertainment in comfort. The Open Range interior décor is elegant without being ostentatious – all of the elements that constitute a home away from home are high quality, from the upholstery to the matching designer window treatments, and the fit and finish is excellent, inside the cabinets and out. With a galley countertop that traverses the floor plan, and appliances in the slideout section, the galley is spacious and well equipped. We liked the residential quality cabinetry with hidden hinges on the doors and we were impressed with the dovetail drawer construction and roller bearing drawer glides throughout the vehicle. The free-standing dual-leaf dinette table can be configured to accommodate two, four, or six people – the ample floor space in the layout makes the 386 FLR galley an ideal spot for dining or entertaining. 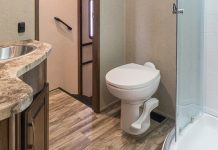 The BeauFlor® flooring in the galley and bathroom is attractive and easy to keep clean, and the carpeting in the balance of the trailer is, as the kids report, “barefoot comfy”. Many RV’ers evaluate the functionality of the bedroom area based on the ease of making the bed – in most vehicles, it is a challenge just to reach the headboard without climbing on the mattress… in the Open Range there is plenty of space thanks to the extra deep king size bed slide-out, and when you extend the wardrobe slide at the foot of the bed there is more floor space than you would imagine to be possible in an RV – with the slides retracted, you can still move around in the bedroom – a definite plus for overnight stops along the route. The 16-inch dresser drawers are a pleasant surprise, providing ample space for your clothing. We liked the quality of construction throughout the vehicle – the wood framed wardrobe doors are beautifully finished, and built to last with true biscuit joints – the modern approach to classic mortis and tenon craftsmanship. 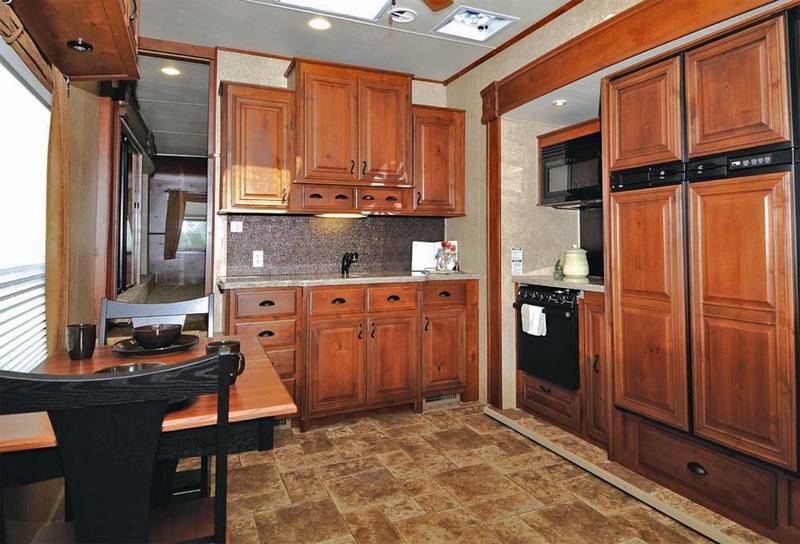 While some RV’s in this size range provide more than one bathroom, this Open Range floorplan is designed with one large bathroom, incorporating a large one-piece fiberglass shower and lots of linen closet space. We like the hand crafted vessel bowl sink. 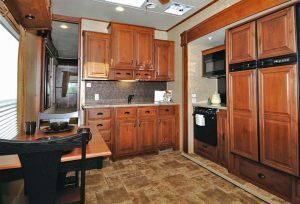 We were very impressed with the Open Range 386 FLR fifth wheel – this is a very well built trailer that meets or exceeds all of our expectations in every respect.